Almost all doors today use a simple latching knob, lever, or grip handle set to prevent the door from blowing open in the wind. Many of these latch operated locks have a key locking feature designed to prevent unauthorized entry. Latches serve their purpose but are prone to attacks in both the keyhole and the latch mechanism. A common attack on latch lock keyholes is a technique called lock bumping. Lock bumping uses a mechanical device inserted into the keyhole with just enough force to bounce the pins inside the lock in an attempt to unlock the key cylinder. Lock bumping attacks can be greatly diminished by adding bump resistant or “spool” pins to the key cylinder making bump attacks almost impossible. A second common attack on latch mechanisms is called “credit carding” or “butter knife attacks”. These attacks are committed by criminals using a thin object slid between the door and the door frame in an attempt to force the latch away from the door frame and into the door allowing the door to swing open. Most entry function latches have a “deadpin” built into the latch to prevent latch attacks but sometimes fail due to poor installation or door shifting. An excellent way to prevent latch attacks is to install a latchguard on the door in the same plane as the latch which prevents the would be criminal access to the latch. 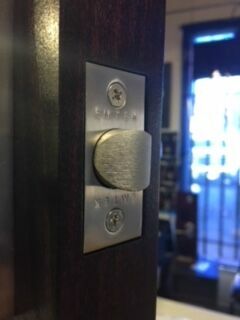 Latchguards are great but the best way to prevent latch attacks is to have a deadbolt installed on the door. Deadbolts provide far more security than standard latch mechanisms. Deadbolts connect the door to the door frame with a moving bolt that “deadlocks” into place and can not be forced back into the door. This feature prevents “butter knife” or “credit card” attacks. The deadbolt also provides a far higher level of defense against brute force attacks where the criminal would physically attack the door using his shoulder, battering ram, hammer, boot, or heavy object to attack either the lock or the door. 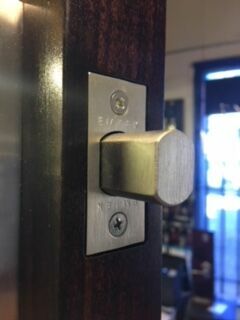 To further increase the security of your deadbolt, you can add a heavy duty security strike to the door frame. The security strike reinforces the door frame preventing force attacks even further. Deadbolts and heavy duty strike plates are excellent forms of security, but to increase security to the next level you can add high security key cylinders to existing deadbolts or replace with new deadbolts to high security with key restrictive features. By either upgrading or replacing your deadbolt, you get increased security against physical attacks and you get increased security in the key cylinder. The increased security in the cylinder will thwart even the most determined criminals attempts at cylinder manipulations while providing you with key control. Restricted key blanks prevent criminals from making a copy of your, giving you peace of mind with the knowledge that only authorized users can make copies of high security keys. High security deadbolts with restricted key duplication and a properly installed security strike is the highest level of security you can get for your door. Suppose you don’t want to have to carry keys. You might consider keyless entry locks. You can purchase a keyless entry knobset or leverset that provides access to your house without the need of a key. A digital keypad allows the user to program a digital pin code specific to the user allowing entry once the correct pin code is entered. The pin code can be shared with family or friends and then reprogrammed to delete the old pin and a new pin entered if the original pin code ever becomes compromised. Alternatively, for even further convenience and the highest level of physical security, you can install a keyless entry deadbolt. A keyless entry deadbolt has all the features of a keyless entry knobset or leverset but all the increased security features of a deadbolt. Another option for digital or keyless entry is a digital lever or digital deadbolt that is remotely controlled by your smart phone. The lock can be programmed or operated via Wifi, Bluetooth, or hub communication, allowing the user to check security of the door or lock or unclock the door from any internet ready location. Once the lock is programmed and paired with the master users smart phone, other users phone numbers can be invited or eliminated once their stay is no longer authorized. The internet ready or smart phone controlled lock is a great solution for AirBNB providers. This allows the provider a simple way to invite renters for a specified amount of time without having to supply physical keys. Physical door security is never going away but the future is here and keyless entry or digital entry may be just what you need to simplify your life.